Tools shouldn’t get in your way. Instead of cluttering up your coding environment with lots of panels and icons, the Quick Edit UI in Brackets puts context-specific code and tools inline. Brackets is in sync with your browser. With Live Development, Brackets works directly with your browser to push code edits instantly, set breakpoints, and jump back and forth between your real source code and the browser view. You can already now download a very early binary and start playing with it, or you can download the source code and compile for yourself. 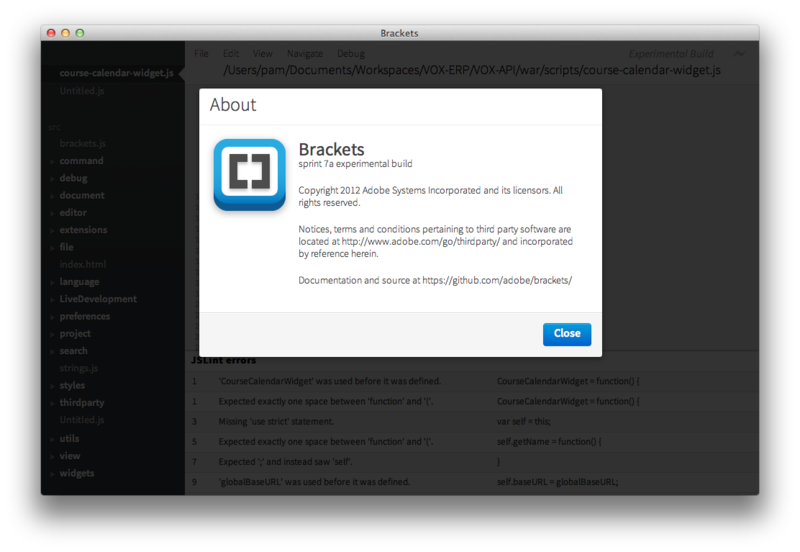 Brackets isn’t ready for general use yet. It’s still very early in development, is missing a lot of basic editor features, and probably has bugs. That said, we’ve actually been using Brackets to develop Brackets for awhile now, so what’s there is reasonably stable. Although Brackets is built in HTML/CSS/JS, it currently runs as a desktop application in a thin native shell, so that it can access your local files. (If you just try to open the index.html file in a browser, it won’t work yet.) The native shell for Brackets lives in a separate repo, adobe/brackets-app, which includes this repo as a submodule. nice one, i will try it. On Bracket’s wiki page it says: Another goal of Brackets is to bridge the gap between code editing and in-browser inspection. This is exactly why made me developing LIVEditor – my soon-to-be-available live html/css/js editor. I works much faster and has many special plug-ins for all most popular frameworks.